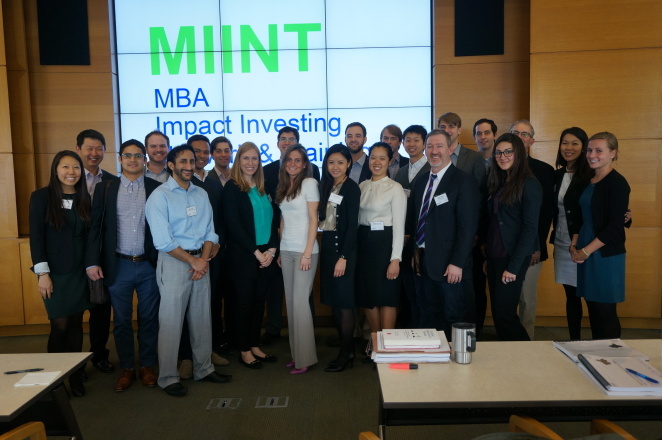 The Wharton Social Venture Fund competed in the MIINT competition finals, pictured here in 2014. Bridges Impact+, the advisory arm of specialist fund manager Bridges Ventures, and Wharton Social Impact Initiative will host the fourth annual MIINT competition for student-led impact investing teams this Saturday at Wharton. The MBA Impact Investing Network and Training (MIINT) is a global program dedicated to training the next generation of impact investors. Under the program, students from top business schools in the U.S. and Europe learn to source and diligence impact investments, and then compete at a live pitch event. The company presented by the winning student team has the opportunity to receive an investment of up to $50,000, which is made by an individual independent investor. Each team creates an investment thesis – focusing on investments in specific sectors such as the environment, education, financial inclusion, and healthcare. The program takes students through a rigorous due diligence process, and each team narrows its selection down to one company that the team feels is a strong investment opportunity. Students present multiple companies to campus-based judging committees, who then select the most promising combination of impact and return to be presented at the national finals. The Wharton School of the University of Pennsylvania does not provide any endorsement, either implied or explicit, in companies that participate with WSVF, Locust Walk Impact Partners, or OurCrowd. Neither the University of Pennsylvania, the Wharton School, nor student members of the Wharton Social Venture Fund are investors in participating companies. Companies run by current students of the University of Pennsylvania are not eligible for review by WSVF.